This universal Plasma TV Bracket is suitable for screen sizes from 37" to 64" and comes with all the neccessary fixings to fit your TV to the bracket aswell as screws for solid and stud walls. The Plasma TV Mount also features a locking facility so that the TV cannot become accidently de mounted. 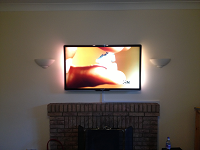 The mount stands 38mm from the wall and is suitable for LED, LCD and Plasma TV screens up to 75kg. The wall plate has fixing points running top and bottom along with its weight capacity of 75kg makes this an ideal wall mount for heavier large screen plasma TV's. The wall plate also offers plenty of scope when fixing to a stud wall allowing you to secure on at least two vertical studs. Screen Size : 37" - 64"
Get this bracket for just £14.99 inc VAT with any of AV Installs ltd Professional TV Installation Services. Our Standard Plasma TV Bracket mounting service comes complete with a cable managment solution and full warranty. AV Installs Bespoke TV Installation service comes complete with a hidden cabling solution and full warranty.